I'm sitting in a room with about 120 linear feet of bookshelves. There are probably another 60 feet of bookshelves elsewhere in the house. There are stacks of books on chairs, tables and desks, and there are books in cartons, because there is not enough room for them on my shelves. I also have books in my office and in the family cars. Since I was in high school, I've usually been in the middle of five or six books, and finished about three each week. I usually receive at least two books each week from Amazon, and pick up about four or five per month at my nearby Barnes & Noble. When I travel, I often come back with stuffed bags from bargain book stores. I love to read and I'm a fast reader, but it's unlikely that I will live long enough to read all my books. I don't mind. For better or for worse, since 2008 I've spent so much time on writing, editing and marketing my own books that I've had little time or energy for reading what other people have written. This morning I completed the almost-final corrections on my Stories I'd Tell My Children (but maybe not until they're adults). Its publication date is 4/1, which is almost here. I've started to write two more books. I could -- or maybe, should -- work on them today, but I decided to give myself a break, and READ. 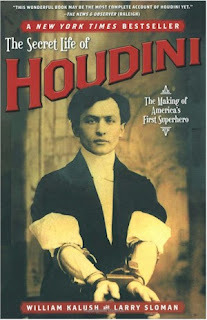 A couple of years ago I bought The Secret Life of Houdini. It's been sitting on the corner of my desk, but I never even flipped open the cover until a few days ago. I was instantly captivated, and could have kicked myself for delaying the pleasure for so long. I had read a lot about America's most amazing magician before, but this book provides new revelations on almost every page. The book makes me want to keep reading and learning, and I'm glad it has nearly-600 pages. I have about 500 ahead of me.